(Spirit Lake)– A public hearing on a proposal by New Fashion Pork to build a 4,400 head hog confinement barn in Superior Township near the Minnesota border drew a big crowd to Tuesday’s Dickinson county board of supervisors meeting. Joe Ulman of the Big Spirit Lake Protective Association was among those opposed to the proposed facility, citing health and environmental concerns, possible impact on tourism, and property values. Jay Moore of New Fashion Pork differed with comments made by some claiming the pork industry isn’t being responsible. Following further discussion, the supervisors voted four to one to recommend the DNR disapprove the facility application. There was then discussion as to whether or not New Fashion Pork would be willing to meet with a working committee to try to work out some sort of compromise agreement that would address at least some of the concerns. 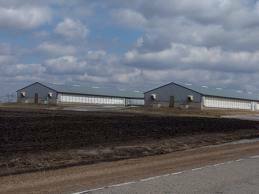 The deadline for the county to make its recommendation to the state regarding a manure management plan on the proposed operation, along with the facility itself, is December 26th. A phone call made to DNR officials indicated the agency would be willing to grant a 30 day extension to that extension, in order to give the working committee a chance to meet, should New Fashion Pork be willing to go along with that process. A public hearing on the manure management plan for the facility was continued, depending upon whether or not the working committee moves forward and is able to come up with some kind of agreement. The committee would consist of two supervisors along with three members of the general public.